Part of deciding to keep goats is figuring out which breed is best for you. There are advantages and disadvantages to all the breeds, but there are nine reasons why you need Nigerian Dwarf goats! I originally decided on Nigerian Dwarf goats because we have an urban homestead. Space was an issue! (Plus, they’re adorable). Even if you aren’t living in the city, there are some good reasons and special considerations to raising Nigerian Dwarf goats. I received a free digital review copy of Nigerian Dwarf Goats 101, and I was super excited! I’ve fallen in love with the breed, but I still have so much to learn. Are you thinking about getting Nigerian Dwarf goats? Nigerian Dwarf Goats 101 is first in a series of books targeted specifically for Nigerian Dwarf owners. So many goat resources are geared towards the larger breeds and I know I’ve had questions about how to best care for mine, so I’m really looking forward to reading the whole series. This first book is a great overview for people who are thinking about getting goats, or know they want goats but are curious about particular needs of the smaller breeds. 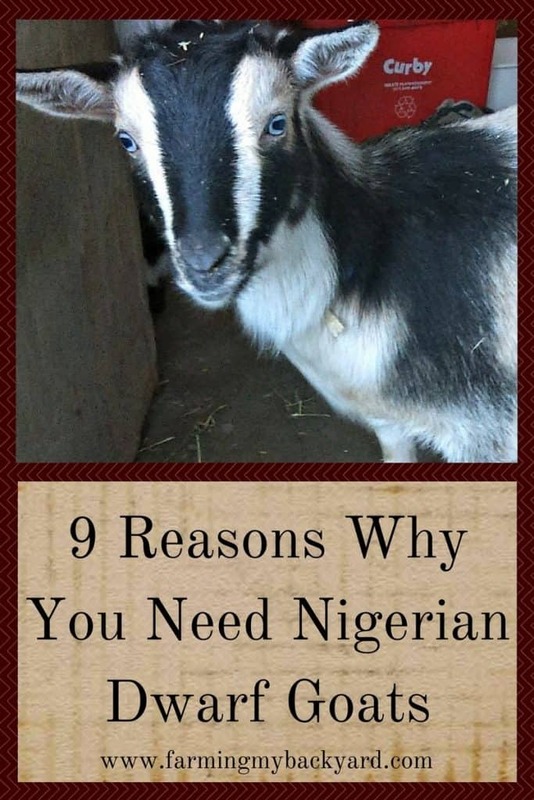 It covers the benefits of keeping Nigerian Dwarfs, basic care concerns such as getting your shelter and fencing set up, as well as things you need to be aware of before committing to bringing goats home. Depending on your goals for keeping goats there are several considerations to make, and Nigerian Dwarf Goats 101 helps walk you through potential issues you may run into, and what costs and downsides you should be aware of before you make a purchase. If you’ve already been keeping goats for a few years the book may be more of a review. It is more geared towards prospective goat owners. If you aren’t sure if you should get goats, Nigerian Dwarf Goats 101 gives a balanced look at the benefits and considerations of raising these little cuties. I’m rather partial to my goats, even when I’m feeling down about my lack of gumption and expertise. My all time favorite thing about the book is all the reasons why Nigerian Dwarf goats are awesome! Oh, and did I mention they are adorable? We’re doing the pet thing mostly right now (time to rebreed, uuuuuugh), but I still love my girls. Yep, didn’t even need to read the article, fell in love with the picture on the book cover as soon as this page loaded. That goat is so cute I giggled. But I’ll read the article now too. Yeah, they sure are little cuties! I purchased two Nigerian dwarfs last August 2017. Still learning every day but love my boys. So easy to love them and they love you back. They love to be brushed and talked too, I think touch is so important and they respond . They are smart and if you have a daily schedule for them they follow it .